A hungry, nervous chef is a potentially lethal condition. 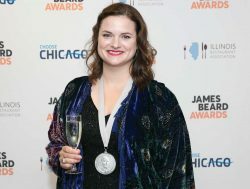 But there’s nothing like winning one of the country’s most coveted culinary prizes — The James Beard Foundation Award for Best Chef South — to rapidly change the mood. She couldn’t help think but think of everything that could go wrong. She didn’t have a speech prepared. She didn’t want to trip and fall. Or go the wrong way. “And talking in front of all your peers, all these people you’ve admired for so long … it was a lot,” she says. Most first-time nominees don’t win James Beard Foundation awards. Only a handful are women. But those statistics don’t matter to Wilcomb. “I’m just really grateful and honored to have gotten the award,” she says. “I think that getting it for Herbsaint is very special for me. It’s been my life for nine years. I’ve invested a lot in this restaurant, and it’s invested a lot in me. So I’m just excited and happy, and most of all very honored that my peers gave me this award. A group effort: On stage at the awards ceremony, Wilcomb had about a minute to thank the many people who have gotten her where she is today. She thanked the team at Herbsaint, her former team, her former restaurant, former chefs, family … friends … family friends … her boyfriend. She thinks she got everyone but says it helps that in the restaurant business everyone knows that nobody does everything alone. Junk food secrets: Wilcomb stocks dried seaweed, nuts and other non-perishables for late night snacking. She’s obviously not big on vices. While she loves freezer pops, these days, hers are 100 percent juice. “I’m trying to be a responsible person,” she says, laughing.